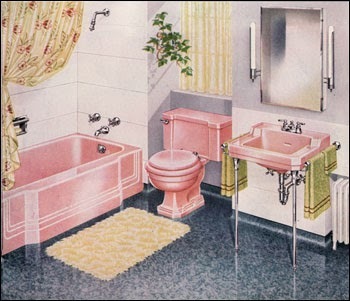 Pink Lemonade: A Bathroom you can be proud of! A Bathroom you can be proud of! A. politely ask her to wait a moment while you quickly stuffed the dirty towels into the bathtub and wiped down the counters. B. Tell her "Sorry, it's broken" and send her in the direction of your next-door neighbor. C. Invite her in because you know your bathroom looks great. If you answered "C", you're lucky, but likely in the minority. Most people would answer "A", but there are probably a few "B"'s out there too. Making your bathroom continuously "company ready" isn't really that difficult, in fact, it's quick and painless once you get it going. To begin with, you'll need to... guess what??... de-clutter. Yes, it seems to be the first step in any project I talk about, but you'll just be moving around fifty things with each swish if you don't. Begin with your Medicine cabinet - Toss out anything that is expired or discolored or has an "off" smell. Makeup that is more than one year old should be discarded (six months for mascara). Put everything you're planning to keep into a box or container and leave the cabinet empty for now. Move on to any cupboards or drawers that you have and, again, discard or move to another spot anything you don't absolutely need to store right there in the bathroom. Fold all linens neatly and replace in their spots, anything else, add to the container from the medicine cabinet. The tops of our counters is next... I used to have tons of stuff on my counter, hairspray, perfume, cleansers, you name it. I have found that if I store these items under the counter or in a drawer, I can keep my bathroom clean much more quickly and easily - so give all that stuff on the counter a good long think before you decide it really needs to go out on public display. Now give everything a thorough scrubbing, it won't take long and will really be quite simple without anything in your way. Don't forget to take down & clean any lighting fixtures you have (you'll be amazed at how much brighter your bathroom is when the fixtures are clean & shiny). Once your bathroom is sparkling, begin to return the items you set aside (again, try to get all or most of it into cupboards, cabinets or drawers). If you have some things you use daily (such as hair products, face cleansers, etc), try putting them into a handled basket that is easy to bring out, use and then replace under the counter when you're done. All you really need out on display is a pretty dispenser or soap, and maybe a bowl of potpourri, a candle or a small plant. After you've been in the bathroom for any reason, make sure there is no evidence left to show that you've been there when you leave (pretty simple huh?) Try keeping a bottle of a lovely smelling cleaner under the counter like my absolute new favorite Mrs. Meyers Clean Day Basil Countertop Spray or some quick wipes like Mrs. Meyers Clean Day Basil Surface Wipes (and they're biodegradable too! )- you'll have the supplies you need to clean up any mess right at hand - plus, they will leave the room smelling so yummy! Now that you've got that bathroom fresh, clean and sparkling, you won't have to worry who wants to use the loo because it will be fresh and sparkling clean! Helpful Hint: Do you have a mold or mildew problem in your bathroom? try hiding a piece or two or charcoal (the kind you use for a cookout [but not the kind pretreated with lighter fluid, please]} under some pretty potpourri in a bowl on your counter (or in a small jar on the floor behind the toilet). The charcoal will absorb most of the moisture from the air so the mold and mildew won't have a chance to get started! Next Week: Another whole list of household tips, tricks & hints, but this time for the bathroom!